Obtaining an MBA has been a goal of mine since early in my career. I had received a Bachelor of Science in business administration from the University of Wisconsin-Stout in 2012, and, after spending a few years working in marketing for national retail and media accounts, nonprofits, and industrial solutions, I knew it was time to pursue a graduate degree. Choosing the University of Redlands was easy, as I found the class schedule and availability of seven campus locations to be friendly to working professionals. I was able to receive graduate credit for undergraduate work in statistics, economics, and accounting, which cut my required class work down by 25 percent. The program offered four concentration areas: location analytics, global business, finance, and marketing. Naturally, I was drawn to marketing by my experience in sales, marketing, and communications. Then—two classes into the general MBA coursework—I discovered GIS (location analytics). While performing demographic research with the United States census, I was introduced to the power of mapping data for visual storytelling. In previous jobs, when searching for project solutions, developing communication assets, or brainstorming new products, we asked the questions “who, what, why.” But it was not until I discovered GIS through the University of Redlands School of Business that I started asking “where.” In my research, I found GIS to be directly applicable to all areas of the organizational value chain; by asking “where,” the answers for “who, what, why” followed suit. Within one week of this discovery, I decided to change my MBA concentration to Location Analytics (GIS). At first, I found the program intimidating, especially as I needed to learn new software. However, I soon found the business school offered tremendous support in partnership with the Redlands-based industry leader in mapping software, Esri. I took part in preliminary workshops on campus that taught best practices, and I sought out additional tutorials online to supplement my classroom learning. As I continued to enhance my GIS skills, I was also polishing MBA-level strategic thinking in my other coursework. Both the MBA and GIS courses required scientific processes, while providing an exceptional framework for exploration and creativity. In addition to working with data and maps, the program connected me with the forefront of 21st century business knowledge. Topics that particularly interested me included: big data management, location analytics, IoT, blockchain integration, tapestry segmentation, value chain, machine learning, social media and web applications, logistics, business ethics, and security. To complement classroom learning, the University offered extensive opportunities for students interested in GIS. A spatial studies group meets weekly throughout the academic year to help students to stay informed on leading topics, experiment with new software, and network for career growth. Students also have opportunities to share work on large-scale platforms, both on- and off-line. I recently had the pleasure of presenting my research at the Los Angeles Geospatial Summit and enjoyed networking locally with my StoryMap presentation at the University of Redland’s Spatial Learning, Research, and Community Service Symposium. Scholarships and awards are also available for students within the program. I was awarded the 2018 GIS Excellence in Business Award and received a scholarship contribution on behalf of MBA-GIS alumnus Kazuo Takeda and the Disney “Ears to You” Program. For academic excellence, I was recognized with Delta Mu Delta International Business Honor Society membership and will soon serve on the board as a first-year graduate recipient. 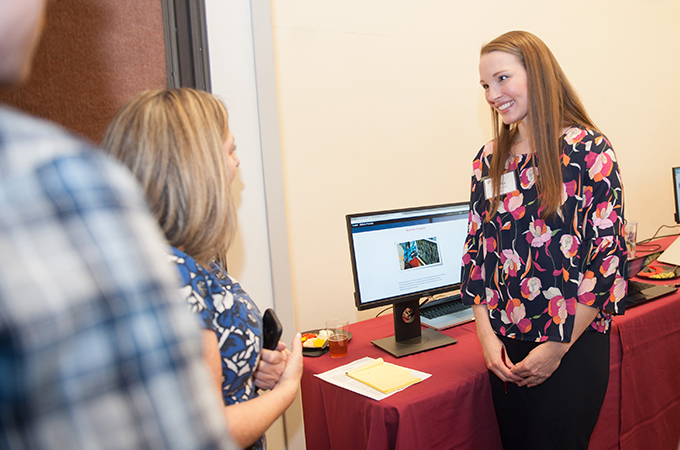 By far the most rewarding experiences in the University of Redlands MBA — Location Analytics program have been the hands-on career growth opportunities, where students are paired with high-performing organizations for on-the-job training and mentorship. Through these opportunities, I have managed project teams to create marketing campaigns for local startups, developed a location strategy business plan for an international nonprofit, and will soon be completing my MBA capstone by performing as an on-site consultant for a leading Southern California business. As I prepare to graduate, I am positive the University of Redlands School of Business MBA program has added tremendous value to my career. I look forward to the opportunities that are ahead, and I am grateful to everyone who has encouraged and supported me in my journey.